This project begins with the body. The body moves; it uses its own language and creates its own laws and dynamics. The role of the body has been reevaluated over the last several decades, and its intrinsic value for the human person has been acknowledged. This celebration of the human body is not new. Reading late medieval mystical sources, I discovered the dancing bodies of female saints, women from the Archdiocese of Liège (modern day Belgium). Those women not only praised the body as part of the human person (on an intellectual level), they also experienced a divine presence rushing through their veins, opening up their bodies as vessels for the divine to incarnate. It is only natural that a dancer would gravitate towards these extraordinary moments of bodily extravagance, I believe. But why? How does my contemporary male body relate to a medieval female body? Is the language of dance enough to connect us, and to bridge eight centuries of embodied history? In this dance I try to discover the identity of these women and reflect on the bodily experience of dance that we share in common. The woman who inspired me the most, at least as an anchor point and as a point of departure for this artistic and academic enterprise, was Christina the Astonishing, Christina Mirabilis. Christina was born in 1150 in the city of Sint-Truiden where she lived an extraordinary life, as her name suggests. Her body resembled the resurrected body, although it was not free of pain. On the contrary, the theme of bodily pain dominates the vita (saint’s life) of Christina. Nevertheless we cannot forget – as Amy Hollywood pointed out in her book Acute Melancholia – that there is also a strange sense of joy in Christina’s life, interwoven with all the horrific pain events. I was inspired to experience this joy, felt by Christina and known to dancers who really engage in the transcendent sensation of becoming dance itself. Christina’s ecstatic rapture often translates to her moving in inexplicable ways, as she is taken up into a heavenly choreography. Christiana’s divinized dancing body was the source of inspiration for this particular choreography. I imagined her being weightless. I pictured the saint on the rooftop of the Church, defying gravity while being moved by the divine spirit. As a dancer I desire the same weightlessness and envy the saint’s privileged experience of this graceful unification with Dance itself. Through my choreography I tried to at least catch a glimpse of Christina’s experience. I believe this opportunity could not be taken by an academic reading of the text, simply because the body is not involved in this process of academic reading. On the dance floor, one experiences when the body is moved. When the body opens up its register and starts speaking, one is moved. I used this feeling of being moved and combined it with flowing movements, feeling the air/the spirit moving through my veins, like a soft breeze leading the way. The body awakens and is carried through the first phrase of dance, until the wind leaves the body and the dancer is left on the floor, lifeless until his body resurrects again – although this time more careful, conscience of the pains of the world. Sometimes the cross is evoked in the body of the dancer to refer to Christ, who – to Christina – is the source of life. Phrases of ecstatic joy and vulnerable intimacy coexist, intertwined in their unique pas de deux, until they fade out and the dance finds its disclosure in a position of prayer. The dance was set in the city center of Brussels, demanding that the dancer’s soft body relate to the city’s hard surface. Performing the choreography outside the safe environment of the dance floor added yet another bodily experience, another layer of interpretation that brought me one step closer to the sacred body of Christina. After all, did Christina herself not use her conflicting relation to the harsh city – the center of human civilization – to conjure purgatorial pains? Time and time again, the intermediate between heaven and earth, our saint, was pushed and pulled as the tide in and out of humanity’s fleshly history, repetitively transgressing the boundaries between life and death itself. 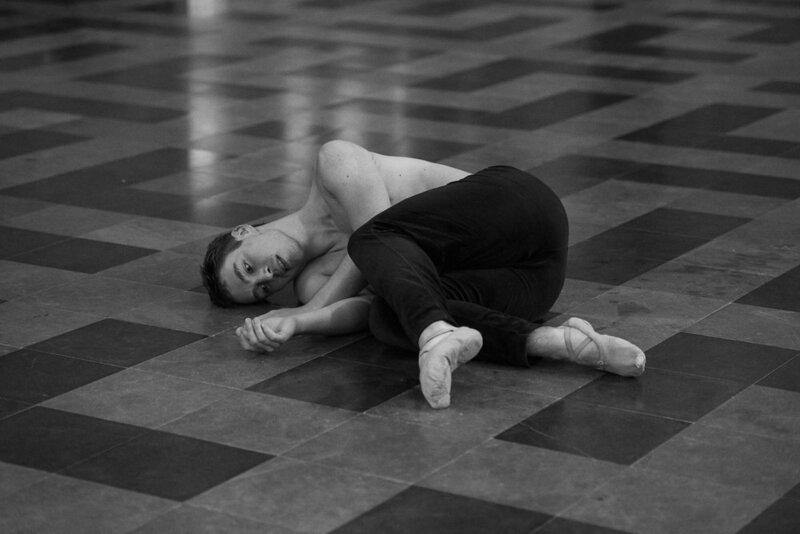 The dancer repetitively and rhythmically smashed his warm body on the cold stones, performing the light and airy choreography for the lens of the camera – the public’s gaze. His body is bleeding, bruised after its floating and falling. However, during the ecstasy of the dance, the pain of the wounded body is present, yet it is not experienced as such until the dance stops and the rapture is interrupted. Yet again, this experience feels very similar to the mystical rapture Christiana and many other female saints underwent. Performing this initial shared of experience of mystical dance helped me to connect to Christina on a bodily level, transgressing with her the borders between pain and pleasure. Patrick De Rynck (ed. ), Christina en Lutgardis. Het verhaal van twee mystieke vrouwen in Sint-Truiden, Sint-Truiden, Erfgoedcel Sint-Truiden, 2012.